A quiet early morning walk on the beach, a way to start the daythe beauty of seeing the horizon, nature, changesa place just to be, the tiny stones tufting the blanket of smooth sand and the musical scores written by the lines created from the lapping of the waves. Small stones warmed in my hand found their way into my pockets. Small stone piles began to form in and around my house. Small stone piles began to form in and around my house. 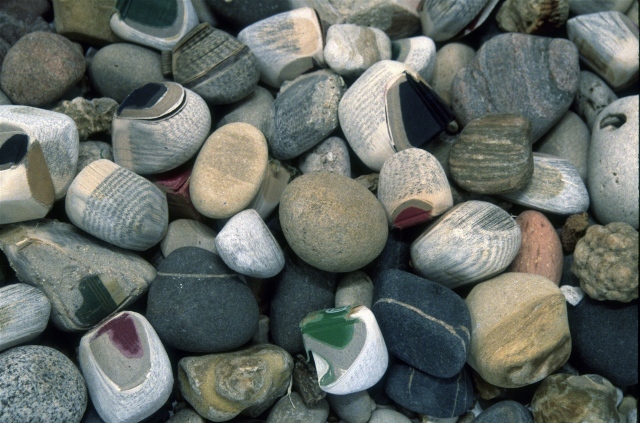 It was the stone dreams though, lucid dreams about stones and their messages that kept me going back, searching. These stones resonated with me. They triggered stories within me. This all occurred during my investigation of the nonverbal narrative in artists books. I was led to explore the essence of storytelling in the absence of words. I thought I wanted to entertain the idea of story development initially through imagery, realizing however, that it was not simply the linear arrangement and progression of images with story telling qualities that I was pursuing, but rather the resonance and communicative quality that are embodied in its physicality. I have chosen the book in sculptural form to explore these narratives of the landscape. The book has been the vehicle of language across the ages. I consider it an intrinsically visual experience, a spatial and tactile object whose form is fundamental to conveying its message. Through the physicality and visual suggestions I hope to not only produce a book and image simultaneously, but also to convey a language in the absence of text that speaks of the complex interaction of nature and humanity.